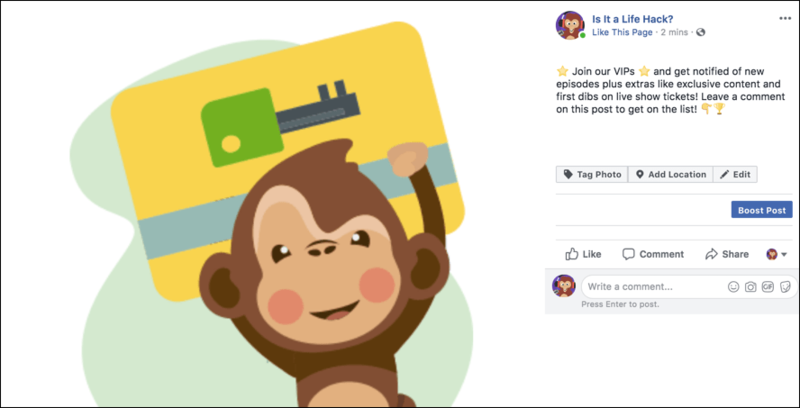 Today I’m going to show you how to use a Facebook Messenger bot in your podcast marketing to grow your listenership, subscribers and reviews with MobileMonkey. 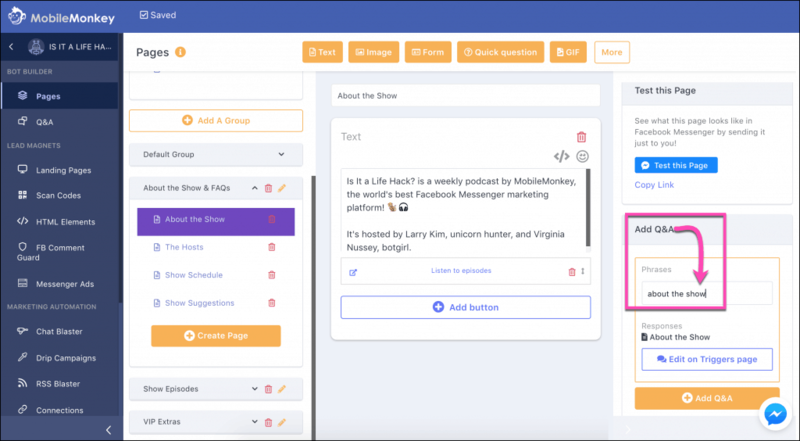 So you can start Messenger marketing your podcast fast, we created a new chatbot template designed for podcast marketing! 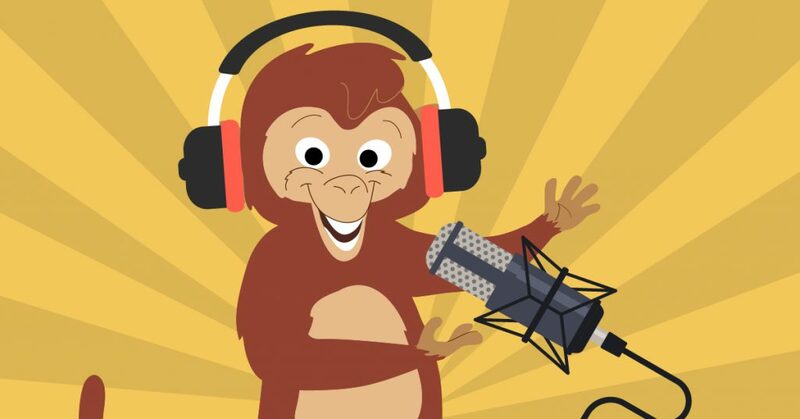 Give the MobileMonkey podcast chatbot a spin yourself here. Then clone the podcast bot as the starter for your own Facebook Messenger chatbot template! 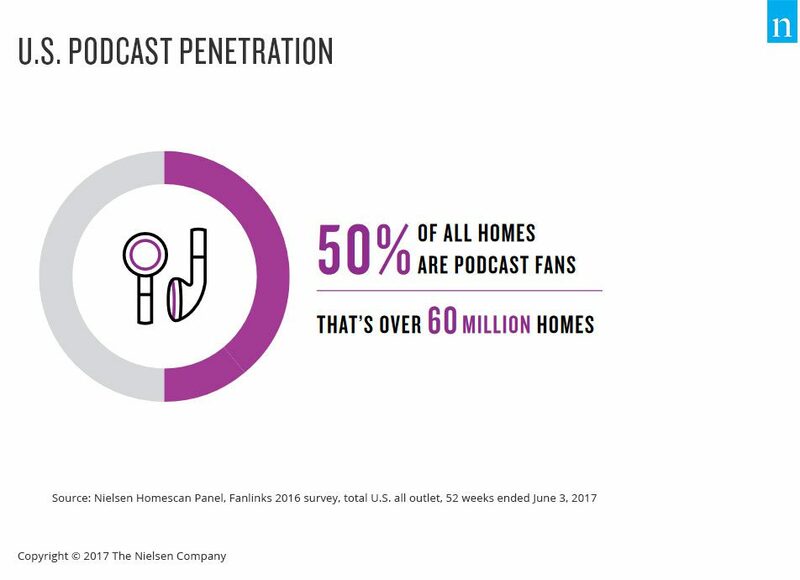 Half of the U.S. listens to podcasts. If you’re looking to reach more of those listeners and keep subscribers coming back for the future episodes, tune in. Podcast marketing with the traditional methods is hard because traditional marketing tools are outdated. The reach and effectiveness of email and social media are dropping, as Larry would say, like donkeys. Facebook Messenger has the highest engagement of any digital channel today. 80% open rate and 20% average response rate is an industry norm. 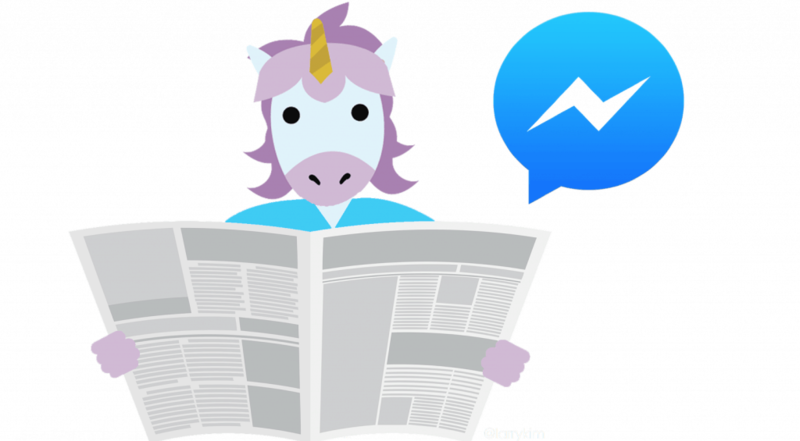 Messenger holds a glittering unicorn of marketing potential for podcasters. 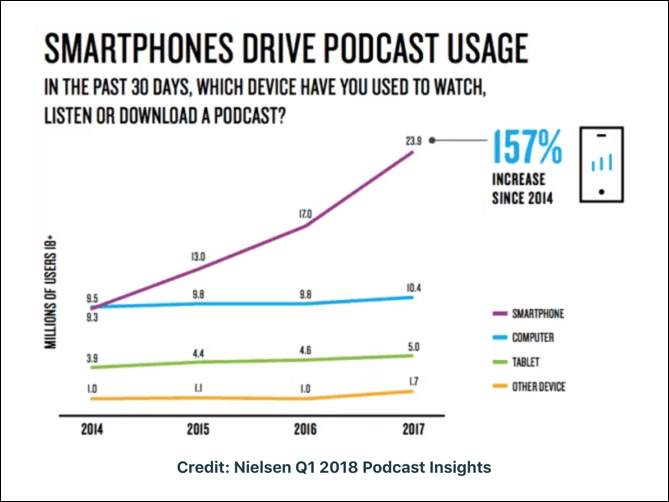 And since most podcasts are listened to from mobile devices, Facebook Messenger is a natural fit to send your contacts push notifications and updates when new episodes are available to drive more listeners to the show. So sign up for your free MobileMonkey account and let’s get started. The first thing we’ll do is some initial set up so people can subscribe to updates and get answers to common questions. Then we’ll turn on the list-building engines. A chatbot is a piece of software that interacts with users in a conversational interface. You program the bot’s responses. These are pages. You also tell the bot when to respond with those responses. These are triggers. 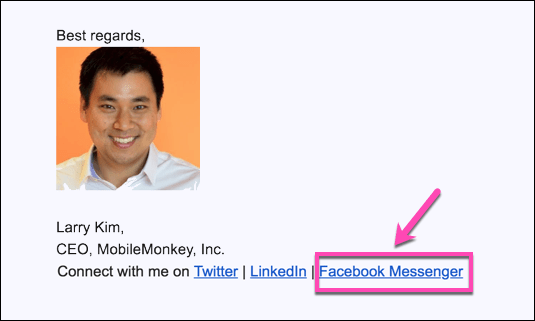 The welcome page greets contacts when they click the “Send Message” button on your Facebook page. 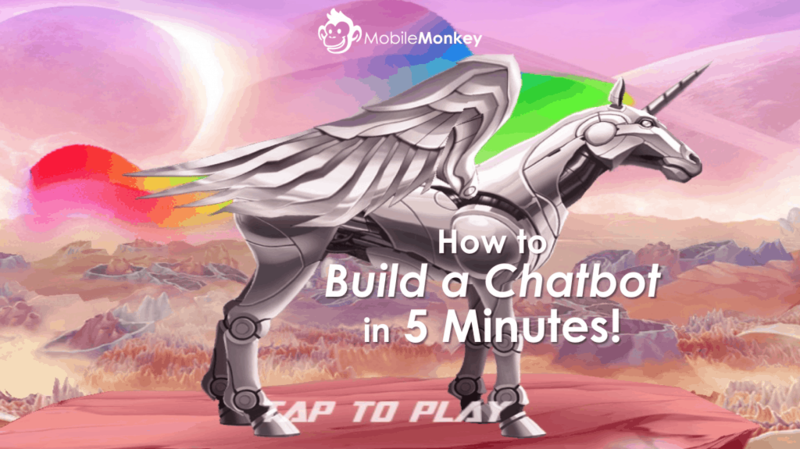 Here’s your required intro reading on how to build a chatbot with MobileMonkey. It covers the drag-and-drop chatbot builder and content widgets, or how you add content to chat pages. 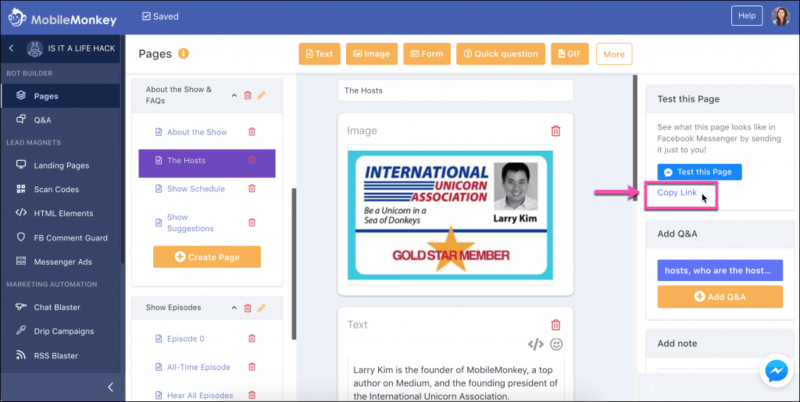 MobileMonkey’s Q&A triggers rely on freeform answers from your audience. You’re able to provide specific trigger words that your chatbot will recognize and then respond to with the appropriate page. 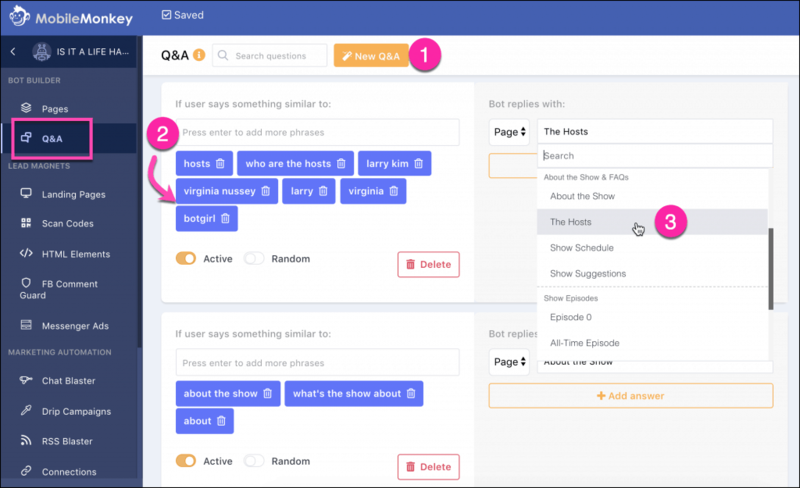 Customize your chatbot by adding Q&A triggers about the show. Who are the hosts of the show? When are new episodes available? Where can someone listen to the show? How can someone subscribe to the show? What are all the FAQs you’ve been asked about the show? Here’s what that Q&A setup looks like in MobileMonkey. In MobileMonkey, lead magnets are the tools you can use to get more Messenger contacts that you’ll send podcast updates to. Landing pages: Create a MobileMonkey hosted landing page with a button call to action to Message your podcast bot. Scan codes: Create a scan code that you can use online and in-person (think posters, stickers, swag) that sends people to your podcast bot. Checkboxes for Messenger updates: Got forms? Add a low-friction checkbox to connect in Messenger. Buttons: A simple button that links someone to your Messenger bot from anywhere buttons go. Links to Messenger: Link to your Messenger bot like you would link to any page. Email signatures are a great spot, for instance. Facebook Messenger ads: Facebook has notoriously interesting audience targeting capabilities whether you’re remarketing to a custom audience like site visitors or page engagers, or doing interest and demographics based targeting to reach a new audience. And Messenger ads are much cheaper than other ad objectives, so they’re a great way to reach new listeners. There’s a tutorial for just about every one of those lead magnets. Read the links above for more details. Meanwhile here are a few of my favorite ways to get more Messenger contacts for your podcast promotion. You’ve got a Facebook page and you post stuff there. You can set up any post to have a Messenger autoresponder and turn your page fans into contacts you can engage with in Messenger. Here’s an example. Leave a comment on this post and you’ll get an immediate follow-up in Messenger inviting you to sign up for updates. Turn your engaged Facebook fans into Messenger contacts you can send push notifications to. Read 3 Stupid Simple Hacks to Grow Your Facebook Messenger Opt-Ins with an Auto-Responder for the full how-to. Make new contacts for your podcast promotion bot with a simple link to connect with the bot. That link points people to connect with Larry’s Messenger bot and sign up for updates. You can do the same thing with a link to your podcast promotion bot. Send people to a chatbot with a sign-up for updates CTA. Share that link like you would any URL or landing page. 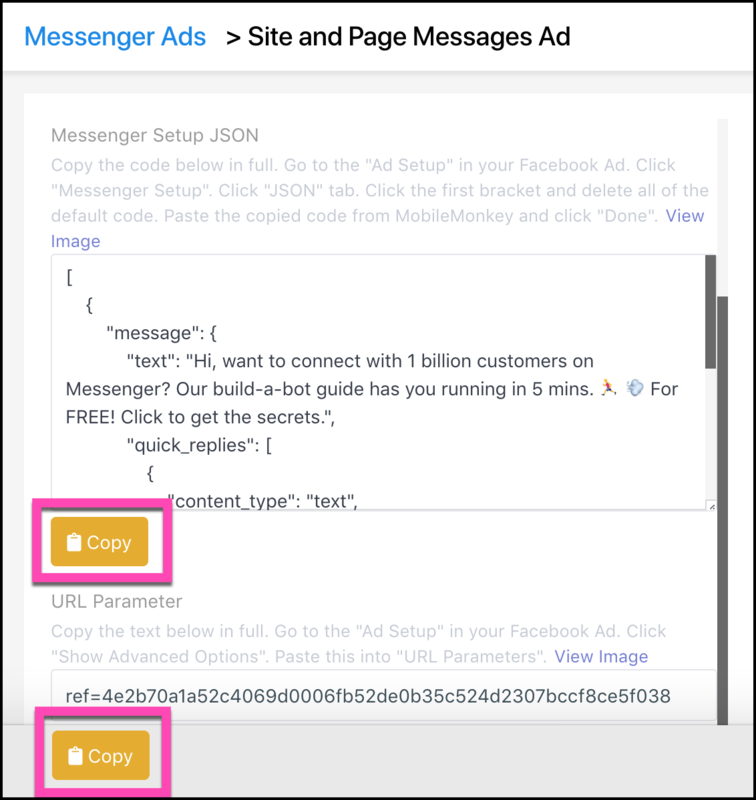 Use Facebook’s new ad type, the click-to-Messenger ad, to pair paid advertising with the chatbot automation. For the full run-down check out the case study on the cheapest way to advertise on Facebook today. Messenger ads are a prime way to make new Messenger contacts for your podcast promotions. Here’s a sample Messenger ad you can view in your own news feed. When you make your Messenger bot your first responder on your website chat, everyone who sends you a message through your website chat becomes a new contact you can message! Interact with the MobileMonkey website chatbot by tapping the Messenger icon in the lower right corner of this very page. See how to add a Messenger customer chat widget to your podcast website in three steps here. Facebook Messenger allows you to send subscribed users non-promotional messages as often as you like. This is how you’ll send your opt-in list updates when new episodes are up so you can drive more podcast listeners. Create an opt in page to collect sign-ups. Create an audience of those subscribers. Send chat blasts (see Step 4 below). Check out the podcast sample bots opt-in experience. I’ve called the subscription update audience the VIP insiders and given signing up lots of value in getting first alerts. 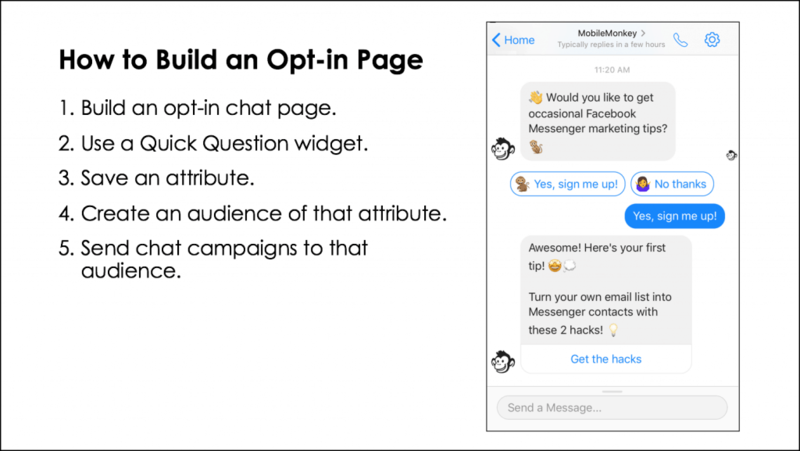 Read all about how to create a Facebook Messenger opt-in page here. Note: The first step for sending subscription messaging updates is applying for Facebook subscription messaging. It’s a few simple steps to apply within your Facebook page settings. Read more about this in Step 6. 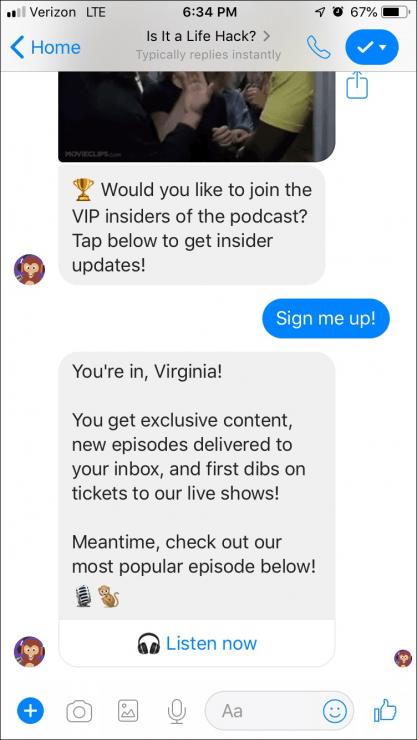 With your bot basics set to welcome new contacts, answer FAQs about the show and sign people up for updates, it’s time to use Messenger to drive more listeners to the show and get reviews. Chat blasting is the Messenger equivalent of a mass email. 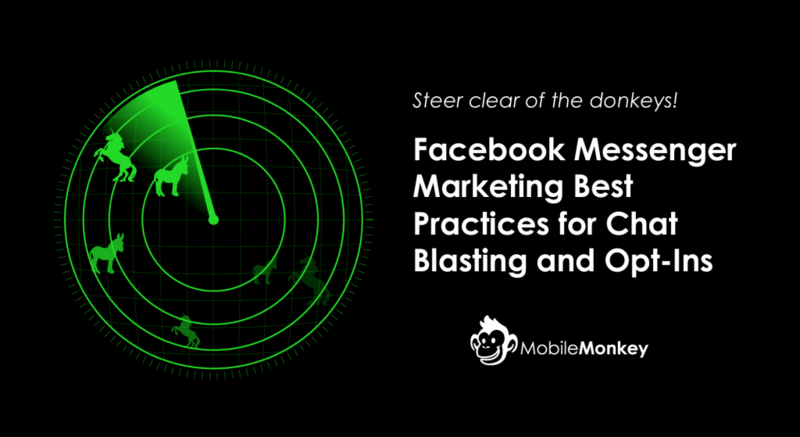 But there are some differences between email blasts and Messenger blasts. One difference is that engagement rates for chat blasts are 50% higher than email on average. Open rate of 80% in the first hour is an industry norm. Another difference, Facebook has guidelines about how and when you can send different types of messaging — they’re pretty stringent about promotional messaging, for instance. Learn about Facebook Messenger marketing rules in Step 7. 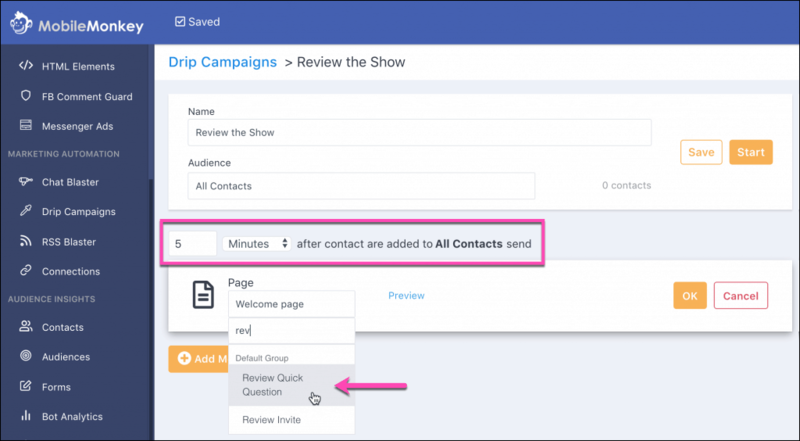 But in a nutshell, if you get approved for subscription messaging (see Step 6), you can send non-promotional messages related to your podcast like new episode alerts and announcements to your Messenger contacts who opt into updates. We created your subscription opt-in page in Step 3. Now, send those show updates and new episode alerts with chat blasts. 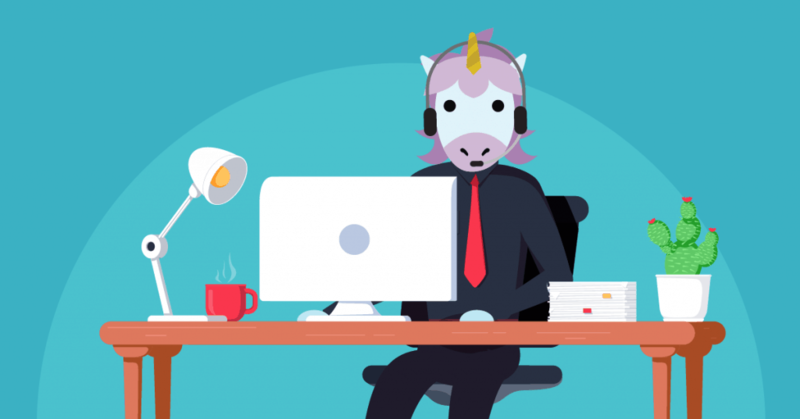 Build your chat page with the free chatbot builder. Create the blast in the chat blaster. Blast it, either immediately or scheduled in the future. Drive listeners to new episodes when you tell them about the new shows, topics, guests and other teasers. 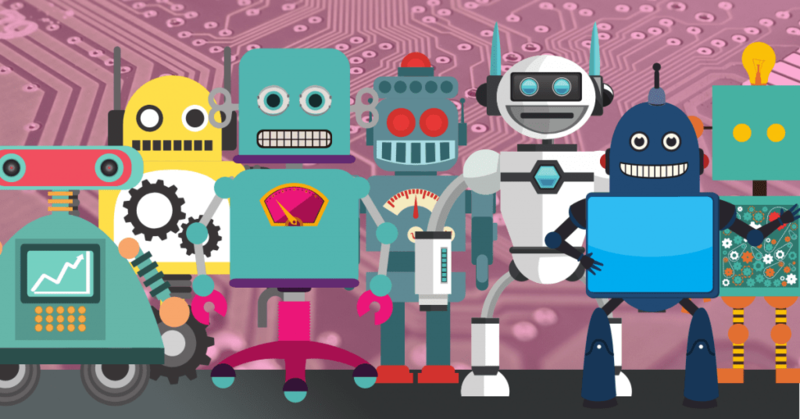 Chatbots offer a way to send personalized messages in a mobile-friendly conversational interface at scale. You can send attachments, videos, GIFs, images, links — anything you can offer on the web or email you can send in a chat message. But what makes Messenger better is that people are more likely to open messages. So use the uniquely engaging medium of Messenger to your advantage when promoting your podcast by keeping your audience engaged with the show. Any creative marketing idea imaginable can be executed with a chatbot. A drip campaign in Messenger is like the drip campaigns you’re familiar with in email automation. Create the content and then schedule it to deliver to a dynamic audience. Here’s the how-to on Messenger drip campaigns that nurture audience relationships with ongoing engagement. Use a drip campaign to invite new contacts to review the show on their podcast app a few days after they first get in touch. You won’t find pre-designed drip campaigns in the podcast chatbot template, but it’s easy to make your own. You’ll experience this drip 5 minutes after you message the podcast sample bot. Here’s how I set this easy and effective nurturing tool up in MobileMonkey. 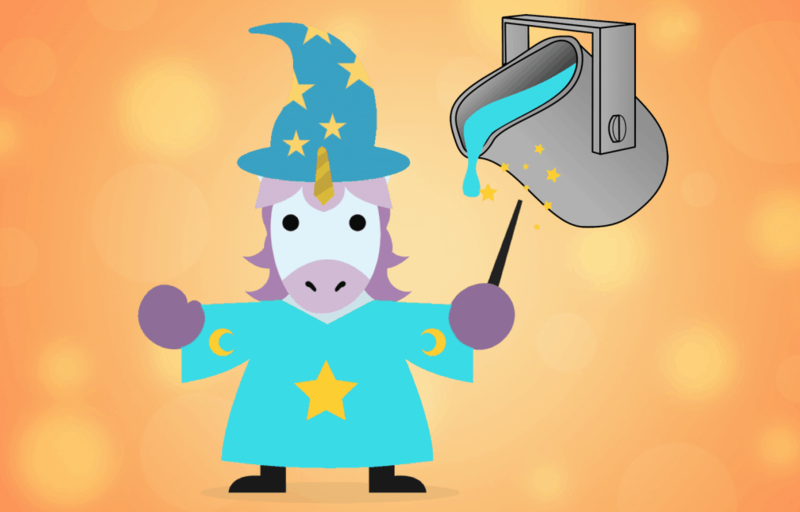 Go to the Drip Campaign automation tool (available in MobileMonkey Pro) and create a New Drip Campaign. You can invite reviews in drip campaigns, but also any nurturing engagement as well, like an all-time favorite episode or interview. You’ve got the framework for your podcast promotion strategy with Facebook Messenger chatbots. Keep in mind the technicalities special to Messenger. Facebook Messenger defines three messaging categories. Standard messaging is defined by the 24+1 rule. In the first 24 hours of making a new Messenger contact, you can send any message you want, promotional or non-promotional. After the first 24 hours, you can only send one additional message. Sponsored messaging is when you pay for a promotional message, or any message with a direct sales objective. Subscription messaging lets you send unlimited non-promotional messages to people who opt-in to updates. Starting Jan. 1, 2019, subscription messaging is approved on a per-page basis. Apply for subscription messaging for your podcast’s Facebook page so you can send VIP updates, new episode alerts and more to your Messenger subscribers. Here’s the quick and easy two-step process for applying for Facebook Messenger subscription messaging. Marketing on Messenger requires compliance with Facebook’s rules. Follow the guidelines for standard messaging, promotional and non-promotional messaging, and subscription messaging outlined above and in this post on Facebook Messenger marketing rules. 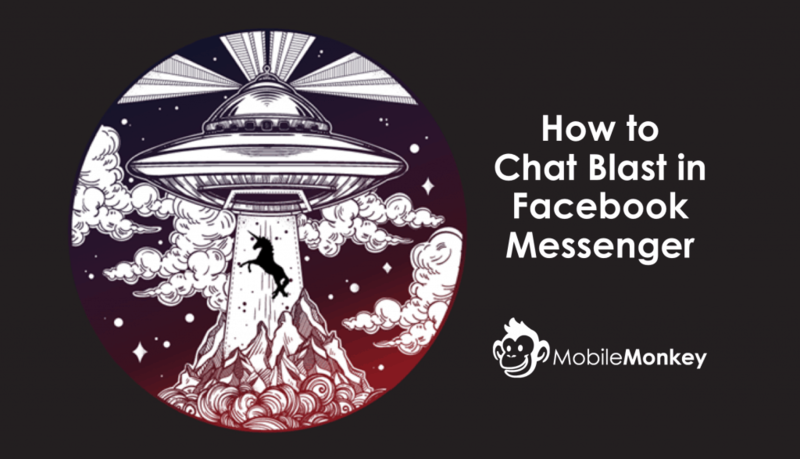 You can also keep in mind these tips for getting top-notch engagement with your Facebook Messenger chat blasts. MobileMonkey is designed to help marketers use Messenger chatbots to get results, with no coding required. 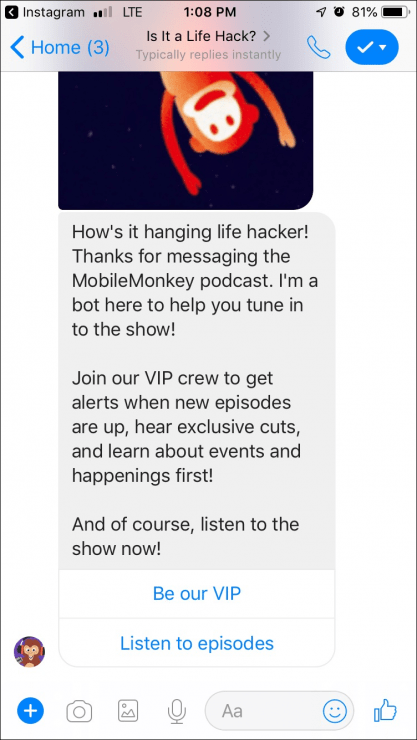 Use MobileMonkey Messenger chatbots to promote your podcast, add interactivity and engagement with your audience, get more reviews, and grow your subscriber list.